Ken Petersen and Shawn Smith have been friends and co-workers for over 15 years. 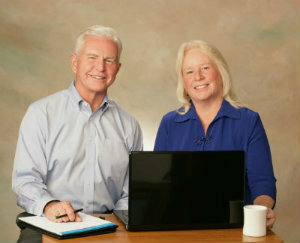 They both have a passion for helping others with personal organizing and life planning. Similar to the experiences that many others have had, they had family members pass away without a plan and no legacy left behind. They rallied with their loved ones to organize final details and search for needed important information, an arduous task especially during a family crisis. Ken and Shawn made it their life goal to be completely prepared with their own personal records so that their families would not be left to search for their information. They were determined to leave a legacy of caring. Wishing to share this with others, they developed the easy to use and concise My Estate Records Guide which organizes all of your important records in one place and the Will and Trust Companion Guide, a companion to your will and trust. In addition, Ken, after working countless hours counseling young adults, had also discovered that many of these people felt lost with regard to their future goals and aspirations. He, along with Shawn, developed High Five Life Goals which organizes your passions, values, dreams, and goals for your life. Why The Bird as a Logo? CompletelyPrepared.com is passionate about helping others find freedom and peace in their lives. The Bird represents freedom and reaching our dreams, goals and being completely prepared in our lives. Rachel Smith painted this bird based upon our concept of being completely prepared in your life. She has captured the essence of who we are as a company and individuals. Thank you Rachel!